This Tryst with Divinity interview with Mr. Ryuko Hira of Japan explores the unique master-disciple relationship, based on the ancient Vedic tenets of utter humility and implicit obedience to the Guru. Today, Mr. Hira's name is synonymous with the Sai mission in Japan, where he has worked hard to create a robust Sai movement and love for Vedic learning. 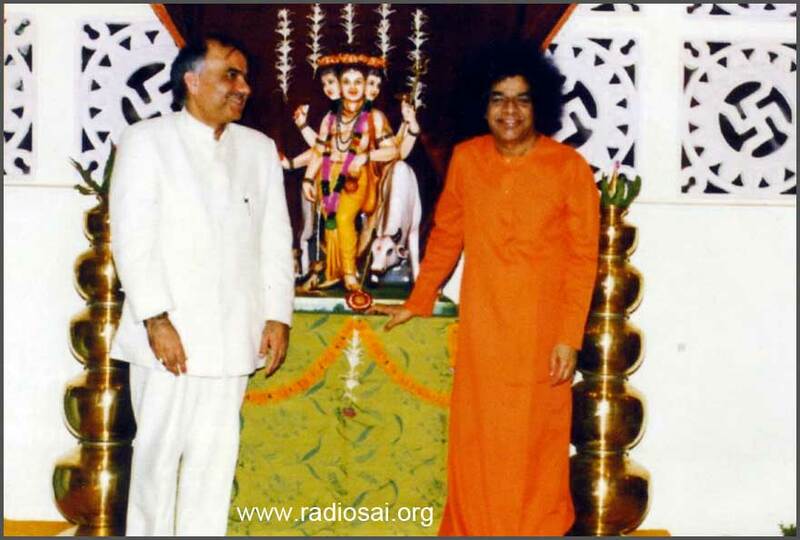 Within the Sri Sathya Sai Organisation, he has served as the Overseas Chairman of Zone B, that spans across Asia, the Middle-East and Africa, covering a total of 80 countries. Despite his conscious effort to maintain a low profile, this spiritual seeker is also one of the most influential Indians around the globe. His vast business empire and commitment to philanthropy extend across continents. Chairman of the Ora Group of Companies in Japan, Mr. Ryuko Hira owns and operates over 50 hotels and resorts in Japan, and provides management and advisory services to 90 hotels. He also runs many other businesses. He was conferred the prestigious Pravasi Bharatiya Samman by the Government of India in 2010. When he is not rubbing shoulders with the heads of states at G8 Summits, he is busy attending Imperial functions. 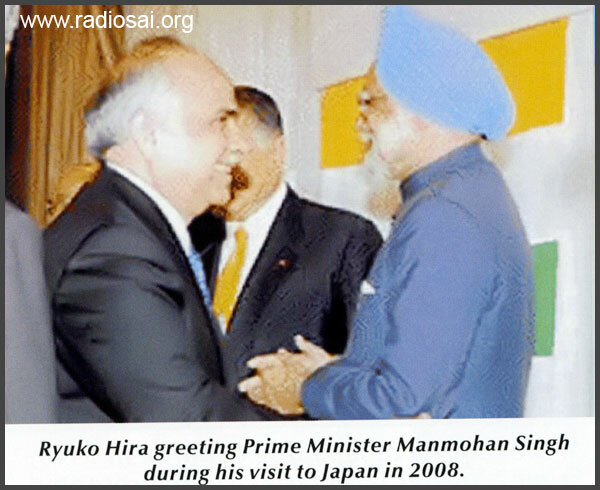 Interestingly, Mr. Ryuko Hira was born Kamlesh Punjabi, in Jaipur, India. He graduated in Gemmology from the Gemmological Institute of America. 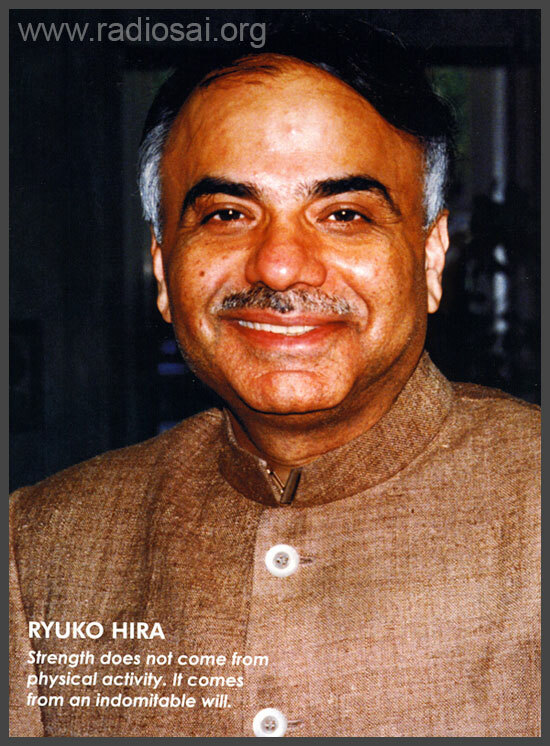 In the late 1970's, Mr. Hira opted for Japanese citizenship. KM – Sai Ram Sir, let us start with your journey from Jaipur to Japan that marked the evolution of Kamlesh Punjabi to Ryuko Hira. It is most fascinating - almost movie material. When and under what circumstances does the chapter on Bhagawan Baba enter the story of your life? RH – Sai Ram! The journey of Sai mission in Japan began in Kobe in 1975 and in 2015, we will commemorate the 40th anniversary of the Japanese Sai Organisation. I was in my twenties then and today I am in my late sixties. So 15,000 days of my life I have had the privilege of the physical presence of Bhagawan - by seeing God, by listening to God, by talking to God and by directly learning from him the mantra - Be Happy. The story begins with the Lord entering Japan through the city of Kobe. What is fascinating is that the word 'Kobe' in Japanese language means God's door! The Lord did not come to Japan through a mega polis like Tokyo but through His door proving to the Japanese that the Avatar is the Avatar. He came as God through the door to God as the traditional name Kobe means just that. Three pioneer Sai devotees - Brother J.T. Khubchandani, and his Chinese spouse sister Regina, late brother Ram Chuggani and his wife Kamala, the present chairman of the Sai Samiti - brother Dayal and sister Hoorey - they came to Japan to introduce Sai and His teachings. Due to my social status, I was approached by Mr. Khubchandani but I knew nothing about Sai. Mr. Khubchandani told me that Baba knows me and He has asked him specially about me. I told him that I have nothing to do with Baba. I do not know Him and I thought perhaps it was all a trap. So I persistently refused to do anything for the group of Sai coming from Kobe to Tokyo. I was rather busy in my work, those being the heydays of the Japanese economy. Nevertheless Mr. Khubchandani was very persistent and he convinced me that his two sons who have been devotees of Sai have been successful in business – namely Mr. Kishan Khubchandani from Africa and Mr. Nari Khubchandani from Indonesia. And he said if I listen to him, I too will be more successful in business. So I had some interest, as a businessman to explore. So they came to Tokyo and I invited all the Indians in Tokyo. I just said I will only provide a hall and the rest you should take care of. They displayed the pictures and they gave a talk on Baba and they introduced the books. And for the sake of courtesy, I attended the meeting and suddenly at the end of the meeting when the presentation was finished, Mr. Khubchandani stands up and tells the audience that he wants to establish Tokyo Sai Centre and without asking me he said that “I have appointed Mr. Hira as a convener”. Though I objected very much and resisted, it just happened that the Indians started clapping and out of the blue I was unwillingly placed into this new and unknown world of Sai. In retrospect each of my 15,000 days since I came to know about Sai has been fascinating, revealing the infinite power of Sai's grace. KM – And, if I may point out, Mr. Khubchandani's prophecy of greater business success did play out. The more you worked for Swami, the more your business prospered! RH - Absolutely. Yes, yes. KM - Even though you reluctantly accepted the Convener’s role for the Tokyo Sai centre, once Baba entered into the picture, how did your life change? RH - Frankly, it was a great mess because transformation is the only hallmark of a Sai devotee. Perhaps I was a greater sinner so it took a longer period to change. My observation is that the transformation of a devotee varies from person to person and for some there is a very drastic change in their thinking process, for some there is a life style change and for some there is a change of career or family and some become very studious scholars of His teachings. Sai chooses an appropriate path for each person which is most suitable for their uplift. In my case a tremendous transformation took place even before my very first darshan. The Kobe centre people had opened the Tokyo Sai Centre. They said that Sai had sent a message that the all samitis must hold the twelve hour bhajan for Shivaratri. And for me it was a great nuisance to inform all the Indians in Tokyo as there was no email and the faxes had just begun - so we had to send a lot of post mail. I sent about 200 invitations for the very first Mahashivaratri in Tokyo, each post costing about 80 cents and I made all the other preparations. As I knew nothing about conducting this twelve hour service, I asked Mr. Khubchandani and he said that all you have to do is just sing the bhajans from 6 p.m. till 6 a.m. with a picture of Baba or Shiva and you should fast all night. But I had no picture of Shiva in my house and only one of Sathya Sai Baba, left by Mr. Khubchandani. Anyway, the day of Shivaratri came and I had a busy day at office and I came in time to find that not a single person had come to attend this Mahashivaratri bhajan in Tokyo. So I thought that they will be late in coming. And I started the prayers and bhajan. But I had never sung a bhajan in my life and I had some experience of playing a piano which helped me to play a few keys of the harmonium. When I started my life's first bhajan on Shivaratri day and since no one came to sing, I was all alone singing and reciting the chorus continuously, and I was singing the same bhajan over and over again because I knew only one or two from that book! My voice became rather hoarse and tired and as I was told to sing continuously, I could not go to the wash room and had to just stay put. Well I looked at Sai's picture and I told him 'buddy I can't do this anymore because I know only these two or three bhajans and we are going to stop it now and I am going to sleep'. So I decided to give up and close this bhajan when a strange thing happened. There were no push phones in those days but the dial phones and the telephone bell rang in my house and I was about 8 or 10 meters from the place where the telephone was kept. So I had to walk from where I was sitting. As there was no one at home, I picked up the phone and I just said “Hello, hello” on the phone but no one answered and suddenly on the telephone a very sweet and melodious bhajan begins and it goes on and on and on and the voice was so captivating that for the first time I experienced tears in my eyes and I cried. The bhajan was melodious and first I kept saying 'hello' thinking that it is a wrong number. The bhajan was so captivating that my whole body, especially the head which was exhausted by singing for few hours like an endless tape was recuperated - that bhajan went on for a long time, about 8 or 9 minutes. KM - Was it a male or a female voice? RH - It was a female voice and it was very melodious. KM - Do you remember what bhajan it was? RH - No Madam. If I go into my old books, I am sure it must be written somewhere. After it stopped, I felt very different and I restarted the bhajan this time with more awe rather than as an obligation to Mr. Khubchandani. As to who could have called me - I was just awed by it. Anyway the clock started to show 6 a.m. and I was relieved that I could now eat breakfast and I realised that I don't have the picture of Shiva, so how do I finish the ceremony? And again a strange thing happened. This time it was not the phone but the doorbell that rang just a little before 6 a.m. A cousin brother Suresh N. Punjabi came unexpectedly as an Air India flight was delayed and he had landed in Tokyo on his way to Osaka. And as it turned out, he had brought a picture of Shirdi Sai Baba with a lingam and snake on the picture. So we finished the bhajan and started to eat our breakfast. I used to be a non-vegetarian - so my usual breakfast used to be eggs, ham or sausages and bacon, but somehow that morning, I could not eat it. The body just would not accept it even though I was very hungry. And the cook who prepared the breakfast said I may have lost my appetite because of doing funny things by singing all night and fasting. So I just took some tea and after that I began to smoke. I was a heavy smoker, smoking two or three cigars a day. And I would have about two packets of cigarettes. But as soon as I smoked, the tongue started to burn and again a strange phenomenon took place at lunch or dinner. Also I could not eat meat nor could I drink alcohol or smoke. So all this lifestyle was gone in just one night, without any pain, by itself - all the alcohol, all the tobacco and all the eating of meat, fish and egg - it just stopped and my whole approach to life changed completely. This was the first miracle and then I began to study books on Baba. The first book that I read was 'Loving God' by brother Kasturi and other books which made me understand how Baba respects India as a nation. Though I was born as an Indian, I had no opportunity to study about India and its glory. 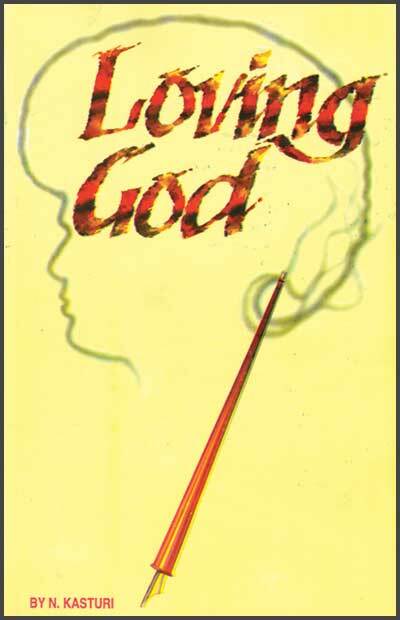 And after reading 'Loving God', I could respect and serve India as a motherland. So to me as an overseas Indian, if the first experience was of the lifestyle, the second transformation was that I became a true Indian, a belief instilled firmly through His Summer Course lectures about the glory and pride of India. Baba said that India is one of the most exemplary nations of the world. That is what attracted me to Baba the most. KM - And in the process, I believe you did go through a personal dilemma because you had to get yourself a Japanese nationality and that required you to undergo a change of name. How did Baba guide you in this? RH - The change of my name, was not by my choice but by necessity. I am the same age as independent free India and during my primary and high school education, we experienced three wars with China and Pakistan. The British rule had not provided enough schools and universities. So even in big cities like Mumbai (then Bombay) where I spent my childhood, the schools were open-air outdoor schools to be shared with street chickens or street pigs and pigeons and dogs coming in and out of the class. And the rains would really drench us all. Life was miserable and to ease the great difficulties, the Communist Party of India would go to schools and they would offer raincoats and gumboots and they would recruit high school students as volunteers for the Communist Party. In my own personal case during my middle school, a veteran Indian actor Balaraj Sahani and others would come to the school and recruit students on behalf of the Communist Party. So India's political situation that time was rather fragile and in the high school they had the National Cadet Corps (NCC) - that focussed on high school students to join the junior army and to serve 30 days in the camps. I was fortunate as my family had some small overseas business which is now nearly 100 years of age. As soon as I finished high school, the Pakistan and the Chinese wars were going on and the ladies and the young ones at home were sent abroad for safety. So a decade later in the 1970s, the situation in India got from bad to worse and the government of India nationalised all the major businesses including the banks, insurance companies, the airlines and others to stabilise the nation. And the major business houses and their overseas assets were also being nationalised. Being a stateless refugee family from Sindh, Pakistan where we had lost and left everything due to the partition (of India and Pakistan), we did not want to live in poverty once again. So my eldest brother said one family member should become a Japanese national to save the family's assets from being nationalised in foreign countries. Being youngest of five brothers, and given some fluency that I had in the Japanese language, I was asked to become a Japanese citizen. But having intensely read Baba's books and teachings about the supremacy of the motherland, I had great resistance to change my name and to give up my Indian nationality. But due to shortage of time I can't state the whole story ... All I recall is that I went to the sacred Mount Fuji to meditate intensely on Baba for guidance on whether I should change my nationality. I came back with the answer that a passport document of nationalisation or a register does not make you an Indian or another national - it is simply a matter of convenience of life. As Baba said - a true Indian or Bharatiya is a person who carries the divine values in his heart. So I stuck to that principle and I recall the stories of five mothers - motherland being just one of the four and others were still with me. So I finally decided to take up the Japanese nationality. The reason for change of name is that less than one percent of Japanese population speaks English. So when a foreign person has a Japanese nationality, they can't write his name in alphabets because our script is calligraphic. We draw our characters. For instance, if you want to write a river you simply draw two banks and water in between. Thus pictorial characters make the Japanese script. If one had to write my Indian name in Japanese language, it would be very funny if it was literally translated - Kamal means a lotus and 'esh' means the king of the lotus and my last name Punjabi in which Punjab refers to five rivers …... it is a bit too out of place in calligraphy. And at the bureaucratic offices there were no computers, and they couldn't write in alphabets, and we had to change the name by law and that was very trying. So there is a Hindu temple (of Lord Vishnu) on top of Mt. Hira in Shiga prefecture which is near Kyoto. At that temple there was a priest who calculated all my Indian names and ancestral names and gave me a name called Hira Ryuko. Hira is the name of the mountain on which the temple stands and in Ryuko, 'Ryu' means the dragon and 'ko' means tiger. The dragon as you know has originated in the Indian mythology and then gone to the eastern countries and 'ko' the tiger or lion sits next to Baba. So the dragon represents prosperity in the eastern culture and the lion or the tiger represents the strength, neither of which I have. I don't have prosperity and I don't have strength. KM – Sir you are being way too modest! Now as an eminent businessman and as a leading hotelier, you are in the thick of the service industry. How has knowing Baba influenced or helped you to get to where you are? RH - It is my belief that Baba is the absolute and the ultimate shareholder of our business empire, and of every empire in the world. Some people realise that earlier and some will realise that later. So the fortunate ones know and the others are yet to discover. Since Baba is the owner of the business, business itself becomes a sadhana or a spiritual exercise. To discover the divine munificence in business is the real purpose of business. That realisation crumbles the ego of the greatest entrepreneur in all ages. Once you realise that God, that is Baba is the doer of all the achievements, which I experienced uncountable times whenever I had to make any important decisions, I would physically ask Him and He would guide more as master of my own business or the owner of my own business rather than as a God. KM - Did the guidance He gave, work in your favour? RH - Well absolutely, I just cannot describe to you a number of times it did. What is more important is not only the huge amount of profits that He grants but how He protects you from the losses. One of the most impressive incidents was one which I physically and personally asked him about in the early 1980s. Japan was very affluent, much more than now and it was investing heavily in foreign countries. And I had a small business of hotels and so there was a transaction which is rather well-known throughout the world. The property which belonged to the Standard Chartered Bank was located at #1, Wireless Road, in Bangkok, Thailand. It is a huge property that the Standard Chartered Bank had acquired and now the bank was experiencing great difficulties. So they wanted to sell the land and being a bank they had to sell the land by a public auction. Our company was invited to the auction. The process is rather strict for very large auctions like this one. The land was the prime location just near the imperial palace and one cannot have it again. It is a very precious piece of land for any development of multi-stories. And we were short-listed amongst the top five parties to bid for this asset at # 1 Wireless Road. We took a team of about 50 people to do the analysis and we made a bid of 800 million dollars for just the land because the bank had to be rescued. After making the bid for that land, we were short-listed amongst the best three and were invited to the regional head office of the bank in Hong Kong to negotiate the details. I had asked Baba that I want to do this transaction to build three huge towers - a hotel, an office block and a residential block. Each one would be about 100 stories and perhaps one of the most impressive developments. And He had said “Yes, yes you can do it”. So I had great confidence and I was proceeding full steam ahead with 50 people from Japan staying there months doing the analytical work and we came on the table to negotiate the final terms. But at that time, I was asked that the money should be paid in third countries to save taxes to the King of Thailand. And we couldn't do that because it was a very high profile public project. So I started to pray to Baba that how come you blessed the project and I am facing these impediments. They gave us one day and there were three buyers to make the decision whether you would like to accept the terms of an offshore payment. The reason for the offshore payment clause was that, as you know Thailand was being ruled by the allied forces of America and England. So the Standard Chartered Bank was established there for a long time and the book value of the land was only one dollar. So if they were to offer the land for sale, the entire amount would go into taxation and the yield to the bank would be rather small. I am talking this in due respect of morality and ethics to all my friends in the Standard Chartered Bank. It is not to raise the bank's immoral points. Much to my disappointment, we did not bid. Another Japanese firm acquired the property and I was very dejected and I thought that Swami's blessings are not the right thing to be asked in business; He is more spiritual. We shouldn't ask him about these things in business. So this particular party, did this adharma of paying in the third country offshore and it was a huge and a high profile project. All the construction was completed and opened but after three and a half years, the promoters were arrested for doing the adharma of offshore payments and not only that, seven years later which means ten years from when the project started, the property market in that country crashed. So just the land alone was for about 700 odd million dollars and three 100 stores buildings combined would be about 2.5 billion dollars. Because of the Japanese boom which had contracted, the crash was so much that the value of all the assets went one third. This just shows how Swami protects without asking. When he says 'Yes', he says so in terms of protection, not in human sense of greed and desire. So there is a firm belief of not to do anything in life without consulting the real owner of the business who happens to be God himself. That is just one of the experiences but I just want to mention that it just crumbles the ego of the greatest entrepreneur. One cannot only feel or think that Baba is the owner but one has to really practice the detachment from wealth and power. KM - Is it hard? RH - Yeah in the beginning it is hard but once you become habituated it is much more easier to put the blame on Baba because He knows what He is doing and you realise actually you start blaming but the secret is a blessing as the responsibility is His too. One time, Baba gave us permission to talk about His influence and to visit the overseas countries to introduce the Super Speciality hospital projects and later the water projects. So brother Sri Indulal Shah, late Dr. A.N. Safaya, Justice P.N. Bhagwati and I went to London and we made a presentation at the Wimbledon Theatre about Swami's seva projects, talking about detachment and seva. For first time in my life I got a standing ovation for this talk about Baba and it was only due to Swami's grace. But the work was only half done. The main point of my visit was to bring the awareness of the primary duty to detachment from wealth and for the people there to make contribution to the worthy cause of Swami's projects. But the second half was to actually see the results in terms of the donations to implement these master projects in those days. Although the people listened to these talks but they were not moved enough to send as much as they could have. And I felt that I had let down Baba by failing in my responsibility to arrange those resources for the divine projects. I was depressed and I consulted my wife and I said we should sell our house in Tokyo and do our duty to Bhagawan because He had given us the responsibility to go there and talk. So I took the estimates of the most reputed real estate agents and they said that the minimum price at which we could sell our house was about 20 million dollars. Next I flew to Baba and He was most gracious to call me for an interview. I told Him that I have failed in my duty of putting together enough resources from other parts of the world and people have not made their contributions. So I had decided to sell my house and we would transfer the money for the divine projects like the hospital and such. Then Baba looked into my eyes and with the greatest ease He told me - “Do not sell your house...which mother will allow her son to stay in a rented house”. 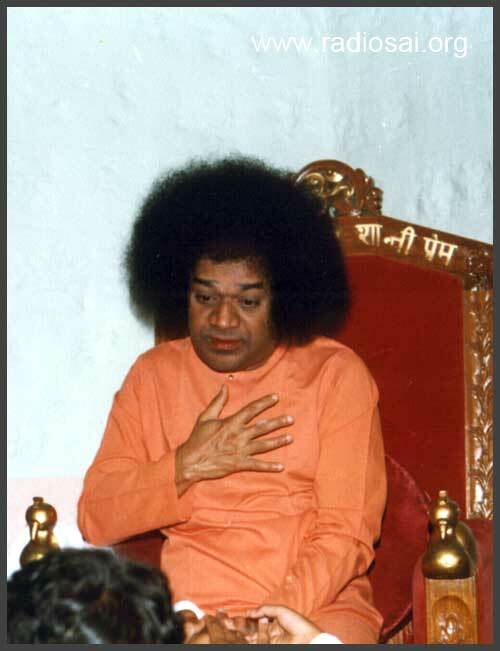 Wealth is only a spiritual tool of divine seva for those who surrender everything to Bhagawan and the other lesson from Baba's influence on one's business is that He does not want anyone's resources. KM - How do you say that when all the humanitarian projects here are funded by donations from devotees? RH - Yes. He does not want their donations or resources. He is only a giver, He never takes and He once said in the interview room - If Bhagawan wills, there will be a rain of rupees. These are His words. So we see that Baba's main message is complete and absolute detachment has to be learnt and practiced by every businessman by keeping all the financial, human, technical and other resources at the divine lotus feet. When He says or when He takes up a project, He does not depend on anybody's donations or anyone's contributions because He knows what is going to happen before He takes. The boy's letter said - O Bhagawan, everyday you are giving discourses that people should make contributions of sacrifice and detachment. However I cannot donate money because I come from a poor family. My mother sends me one hundred rupees to pay to the dhobi to wash the clothes at school. I will start washing these clothes by myself and if you can buy one brick with those hundred rupees, then I have done my seva or my duty. We were listening to Baba that a child had written that. So we see the purpose of Swami informing the people about the projects is not at all to collect donations. He moves us to a spirit of detachment and that is a significant inner shift. God never takes, He only gives. He is absolute. The humanitarian projects are only for the process of inspiring people to detachment and He gave a great message about the definition of detachment. So what is attachment and detachment? He said that deep attachment to God is detachment! The only influence of Swami in business is to surrender - the business belongs to Him. He is the chairman and the shareholder and we are just His humble servants and are to continue working according to His teachings. KM - Including following ethics where you lost such a huge deal in Thailand for example, and in the process you gained because you could have been a victim of the huge loss. RH - Yeah, well I would be on the streets! KM – A person of your means can easily educate his children in the most prestigious of private schools anywhere in the world. Your daughter has studied in Baba's school in Prasanthi Nilayam and your son continues to be a Sai student in Puttaparthi. Your children could well be attending schools where royalty studies. How do you explain your choice? The educational institutions of Bhagawan are the most prestigious, or rather the only prestigious schools in the whole world. The prestige of a school is comprised by academic standards or it is sports standards or by standards of character building. If the Sai schools were to participate in the global grading process of the world's best institutions, they will all have the highest ranks. I have seen, I have experienced and I have worked myself to receive my own satisfaction and I am convinced that the Sai school is the world's most prestigious school. RH - And sarees, please pardon me. 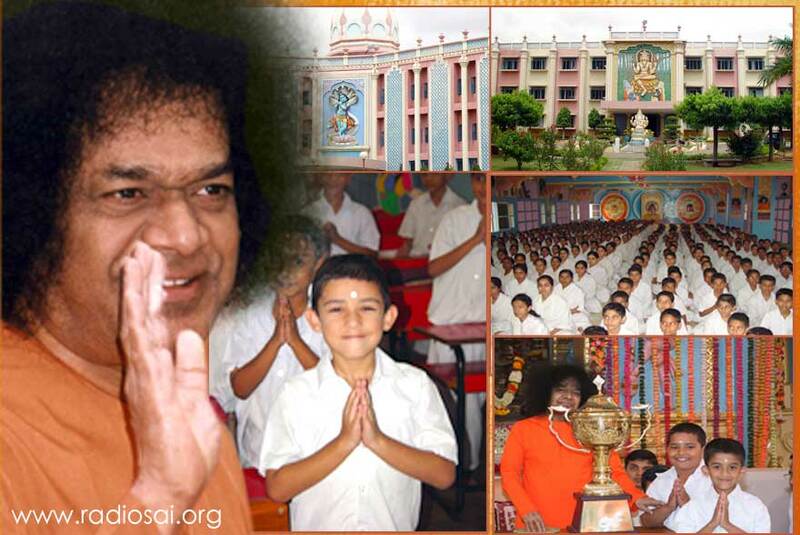 Bhagawan has chosen the world's best teachers to be the gurus in His institutions to carry His mission further. His teachers continue even today in the same tradition and I am sure this will continue for ever in the Sai schools because that is His sankalpa or divine will. Take the example of Sage Valmiki - he was a transformed teacher and who taught the Ramayana to the divine children of Mother Sita - Luv and Kush. And later Luv and Kush sang the divine story of Ramayana during the 'Ashwamedha Yagna' congregation. And at that time Lord Shri Ramachandra confirmed what was sung by these two children is true. Even today all the Sai students sing and extol the glory of the Avatar. 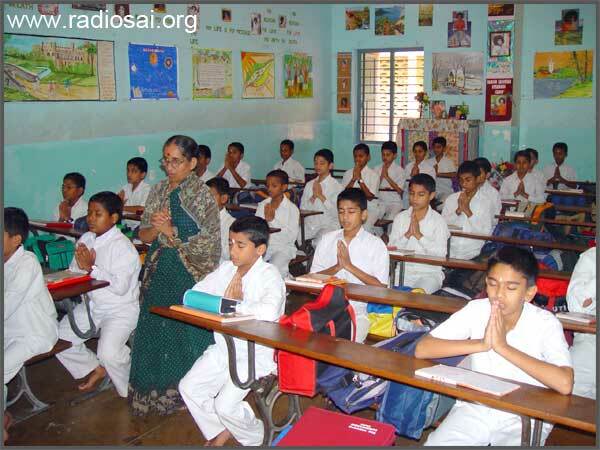 There is no difference between Valmiki, Vashistha, Sandipani and present Sai school teachers. The only difference is that it is happening in the present age and we are able to witness this. But somebody has to academically study the process and analyse and scholastically put it in that framework. Then we have the similarity of the Sai teachers who resemble the highest ideals of the iconic teacher - Sage Vashishtha, the ideal teacher of Lord Rama. You see Sage Vashishtha established the system of gurukula - it starts from him - the residential college on the banks of river Beas and he was taking care of thousands of students in those days. Today Sai schools are similarly located on the holiest of the river Chitravati and each Principal of the school is a sage who has undergone the penance of surrendering their entire lives, 24 hours, 365 days only for the welfare of Sai children. The Sai principals and the teachers have done more than the parents can do. They have surrendered their entire lives to Sai mission. I have no question in my mind that I have made the best choice for my children and this will continue till I am able to deliver my promise to Swami that the first Japanese citizens to become Sai students are my children. 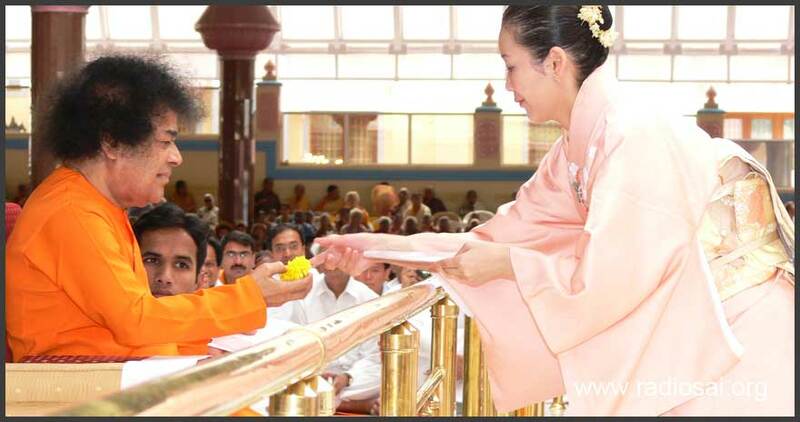 I had prayed to Bhagawan that they bring the Sai ideals to Japanese schools. It may take another 30 or 40 years but I have chosen that school for my children because I prayed intensely to Baba for 8 years to please accept them and for 8 years He couldn't accept them. And only after that He blessed them with this highest boon one can get, which is to become a Sai student. I am quite sure of my own personal reasons for not choosing a Japanese school because as you know Japan was defeated in the Second World War and General McArthur wrote the new Japanese constitution which prohibits spiritual or religious education. Even the Japanese public schools cannot learn about their own spiritual or religious values. This was done to maintain the supremacy over the defeated nation by suppressing their national values and ethos. So the Shinto and the Buddhist and other religions were prohibited from the syllabus. As a consequence the outlook is very scholastic, very materialistic in the Japanese society with no spiritual base in the educational system. Of course there were excellent private schools which I could have sent them to, but there is nothing to match the requirement of an ideal Indian school. So we prayed to Bhagawan and He granted our prayer. KM - Your family's commitment to the Sai mission in Japan includes your wife Mrs. Kayoko Hira's involvement with the Japanese Institute of Sathya Sai Education as its head. All this work is very time consuming and requires deep commitment as does your vast business empire. Where does this family of overachievers draw their inspiration from? RH - We don't fit that comment of yours but about how to draw inspiration comes from the very word 'inspire' which is the motivation of the inner spirit as you know - the inner aspirations, the secret of finding time and deep commitment comes from 'Jyoti or light meditation'. The Dhyana Vahini is the theory of success because without concentration you cannot take one step in life. So the Dhyana Vahini is the theory of success which helps every entrepreneur. KM - Do you practice Jyoti or Light meditation? RH – Yes, everyday. And this Jyoti meditation is for three things - it gives the breath, thought and the time. So when we do the Jyoti meditation the life source of our breath is regulated which involuntarily controls the thought process and it brings a tremendous speed of action which saves a lot o time that can be used for Sai Seva. This simplest of theories of Bhagawan (Jyoti meditation) grants infinite rewards. There are seven steps involved. The first is the environment, as the breath comes from the environment. If you are in good environment, good thoughts come, which is called 'Satsang' all the time, be in good place. Then the breath itself conveys the thoughts and the thoughts themselves lead to the so called will power or the Ichcha Shakti - to do something and from that Ichcha Shakti we come to the Kriya Shakti that is to exercise the actual action power. And from that our habit or character is formed and that habit or character decides the destiny of man. These seven processes of Dhyana Vahini, are one of the most handy tools for business, making it the easiest to take care. KM - Let us talk about the interview where Baba stressed upon the importance of youth and high ideals. This in turn led you to explore Baba's childhood history. What can you share about that incident? RH - There was no youth wing in the overseas Sai Organisation at that time. 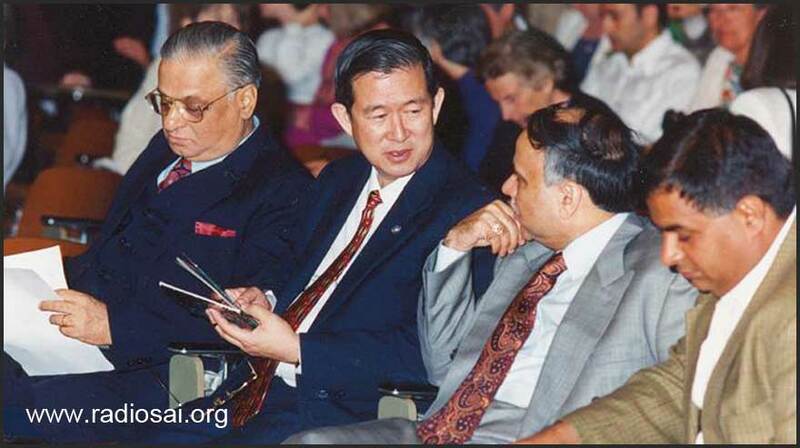 We had no youth wing till we started it at the first Asian Sai centres and later the other countries joined. So we organised the first international youth conference and a number of youth schemes were started which were later on adopted by Indian Sai Samitis. And I believed that the best way to see Swami's reaction for youth programme was to deliver Baba's very own lifestyle as a youth. Very little was known about His youth years, especially in English language at that time. So I asked Swami for three things - permission to hold the first ever exhibition on the theme of Mother Eswaramma and this exhibition was held at Whitefield in Bangalore which He inaugurated with His divine hands. The second was a prayer to accept the life size photo paintings of Mother Eshwaramma and Father Venkamma Raju which He blessed and are decorated in the main hall of the Trayee Mandir and the last permission which we asked Him was to have the first international youth conference. After this youth conference I realised there was a tremendous need by the youth to see Baba's actual youth behaviour. And I decided to make the first ever live stage drama play on His youth. And I went to pray and seek His permission and He said “No Hira no”. He first said 'no' because I guessed our presentation may not be up to His highest standards and expectations. Nobody can play the youth of Sai and we can't expect Baba to watch the rehearsals but anyways He said 'no'. But I was very adamant and rather persistent so I continued to pray and I fasted till He would permit. So on the day of my departure He finally said “Japan come inside”. He then put several strict conditions - He said “if I allow you, I have to allow everybody”. I said Swami that is your business whom to allow whom you don't because you know who can do what and who cannot do. Finally, He imposed several strict conditions. The first was to portray not the youth of Sai but the childhood of Sai. He said keep it as Bala Sai only during His school days. This was very difficult because very little was known of His school days. So we collected information and interviewed extensively because the presentation had to be perfect, which, by His grace proved to be most successful. All the rules laid by Baba were maintained, for instance all actors were girls who were dressed as boys and the name of the play was 'Raju'. He materialised several gifts for the actors in the end. And after this I prayed to him for the Sai youth to be allowed to do the play on Eshwaramma - the first play. If He permitted a play on Mother Eshwaramma, He would naturally allow us to bring the youthful Sai. So this play we showed that how Sai as a youth lived with mother Eshwaramma and practised the three ideals of respecting parents, teachers and elders. This play was held in the Kalyan Mandap in Trayee Brindavan and after the play was finished, Bhagawan stood in the hall for a long time, blessing all the few hundred devotees from Japan. He was immensely pleased. When I escorted Him back to the Trayee Mandir, He said that “the Japanese actor was so good that I am afraid the people will think that he is real Sai and they may go to worship him instead of Me”. KM – You did go about the matter quite methodically, doing your research, and fasting to get your way with Him. RH - Yeah it is not very easy to please unless there is very firm determination. If people are half-hearted and if He gives permission then you know God can be very chaotic. So He has his own standards of granting permission which only He knows. KM – Given your history of close association with Baba, if you go down memory lane, what are your fondest memories of His divine grace? RH - That He is always there when you want Him - that is the fondest memory. There was a time when there were no Bal Vikas teachers in Japan and I couldn't learn to pronounce Hindi properly. But I had to learn as a teacher first before I can teach. 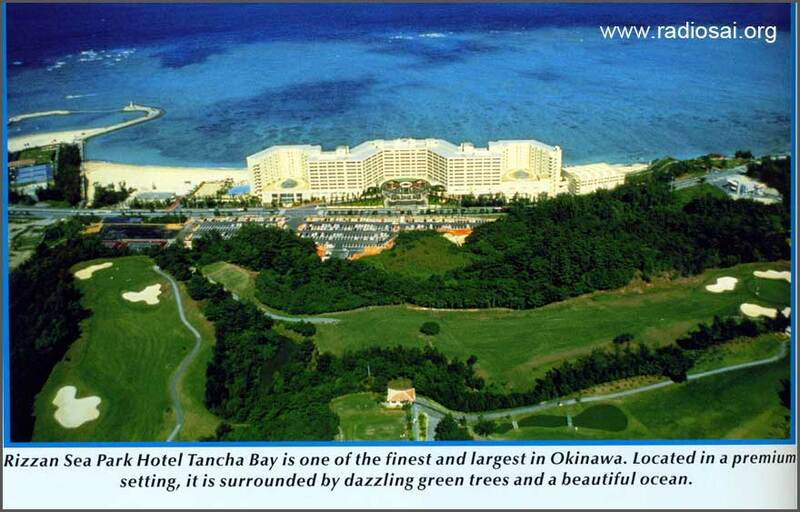 The southernmost island of Japan was Okinawa which was two and half hours flying time from where I lived (in Tokyo) and the students said they wanted to have a class every week and they had no teacher. So I used to go every weekend flying two and half hours each way to teach over there. And then on the ending of the class He showers all the students with the vibhuti. But one of the most memorable incidences is that - there was a young Japanese boy - he is no more now - his name was Mr. Hoshino from Kobe in Osaka. The vibhuti of about three and a half inches appeared on the whole picture of Baba - full picture of abhaya hastha. But this vibhuti was different from any other vibhutis - this vibhuti was golden in colour. We had never seen anything like it before. So I brought the sample of the photo and the actual vibhuti and I was fortunate when He called me in the interview room, I asked Swami why this vibhuti was golden? And He said “silver devotion - silver vibhuti, golden devotion - golden vibhuti”. We distributed the pocket calendar photographs of that about thirty five years ago in Prasanthi Nilayam at that time. KM - Baba must have spoken to you and your family many, many times? RH - In the last few years He was most gracious. He would call home for dinner to Yajur Mandir at every visit. He would very graciously give spiritual advice and what to do for the organisation. He was always concerned about the Sai work which was going on in respective countries. The key point He mentioned once is that when a child is born, the mother and father prepare everything from the cradle to the toys, baby's clothes and they make plans for her/his studies and they have hopes. 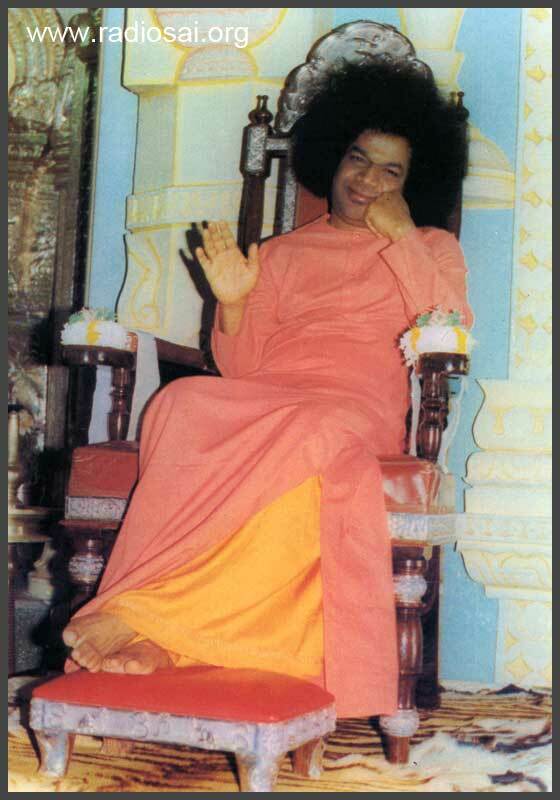 He asked “do you think when God is born that no plans are made when He comes on earth?” So He said that all the Sai organisations people including the ones who are yet to join are a part of the great divine master plan - we may be aware of that or we may be unaware of that. And therefore once that awareness comes that we are a part of the divine, we are His hands, we are His feet, we are His fingers, we are His eyes and the concept changes. And then He intervenes Himself because the question was of divine interventions. So when I would visit the Bal Vikas class, I couldn't pronounce the Hindi words He would just at that nick of the moment bring the words which I had never learnt in my life. Many times I have experienced such divine interventions. KM – Here's a hypothetical question. 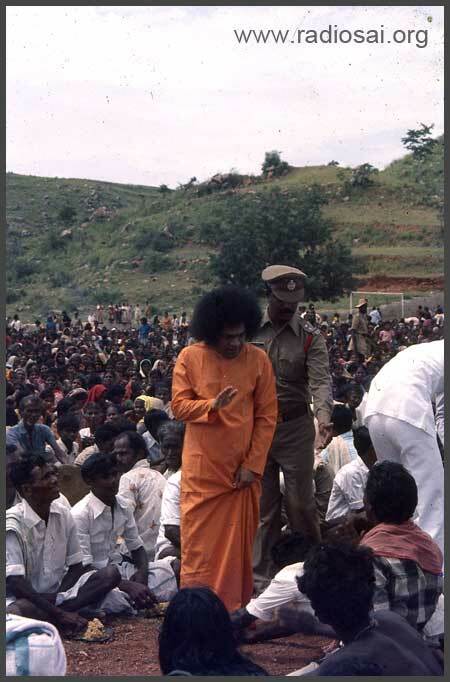 If you had just one moment to interface physically with Bhagawan right now, what would you say to him? RH - Silence is what He prefers usually. No Avatar has given His feet so freely to the public. So if He was to appear physically, I would just ask for His divine lotus feet. Nothing else. KM - Do you long for the physical form? KM - So beautiful wasn't it! Baba's Mahasamadhi - what does it mean to you Sir? RH - I think the Mahasamadhi is the symbol of detachment from the body and of the great awareness of one's own self. KM - In your opinion, what is the future of this movement in the physical absence of the Avatar? RH - The Sai Organisation is still in the evolutionary process like man's very own physical evolution which took a long time. He said that the organisation will live for a thousand years. So far it has only evolved for fifty years. That is a mere 0.5 percent. The evolution of 99.5 percent is yet to unfold. KM - What are our challenges, in the process? RH - In the true sense, being a divine organisation there really are no challenges at the moment. The challenges are just an illusion of the people. A divine organisation of Sathya Sai has no challenges. But if one ponders deeply, the ignorance of the Self can be one. We must have a very clear short, long and medium term planning which is already in place but still Baba doesn't want any numbers. He has always talked about high quality. And therefore the evolution will be very slow but it will be in perfection and in that sense because it is slow there are many people who are unable to catch with that because it is a fast world at the moment. So I think that is one of the possible challenges. KM – Why is Baba's message so important in today's world? RH – Our population has grown to six billion and is likely to reach ten billion. That translates into more people, more thoughts and more thoughts require more clarity. So the purpose of the Sai Avatar is to simplify, to decode the divine message of the Vedam because He is the Veda Avatar Himself. Thus the relevance of the Sai Avatar has just begun in global terms. Now when we take the view of the six billion people and when we have a comparative study of the Avatars - we look at Lord Christ, we look at Lord Buddha. In Christianity, the first Bible came 500 years after Lord Christ. So we are nowhere near in terms of time frame. It is just so recent since Lord Sai has left the body and in case of Lord Buddha, it reached Japan 700 years after He left the body. 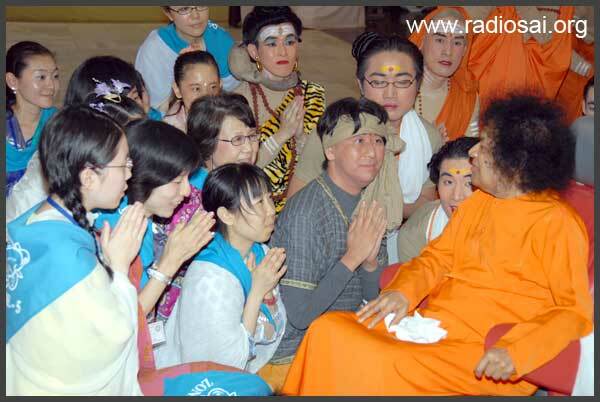 Swami posing for pictures after a play on Sankaracharya, by devotees from Japan, Oct 2009. You can read more about the events of that day HERE. Baba's message is so eternal that it will bring the change that is needed. 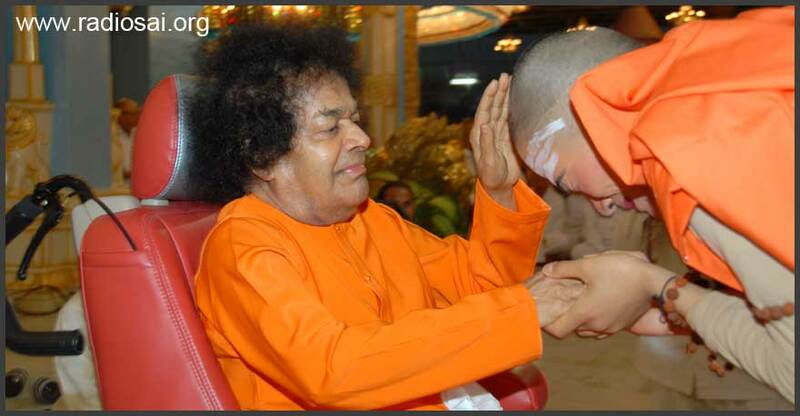 KM - Finally who is Bhagawan Shri Sathya Sai Baba for you? RH - Well, you got me a very difficult one. Right at this spur of the moment I really do not know. I still have to find out I believe because to find a word that befits His glory is beyond human description. 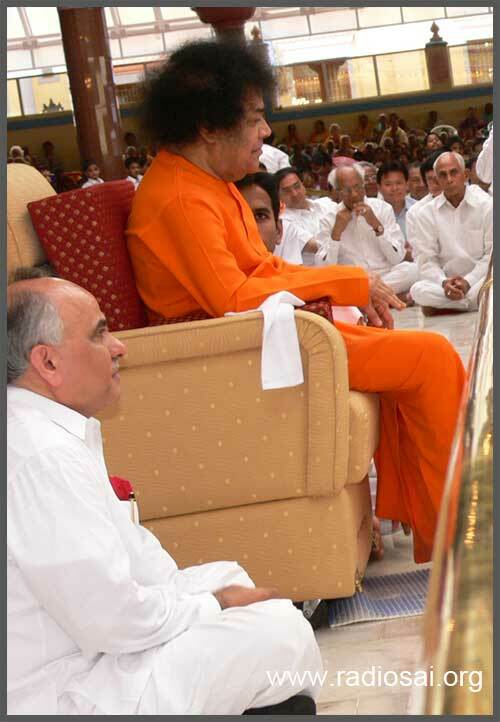 Human beings cannot describe Sathya Sai Baba. It is impossible for me to describe His glory. At times He is the father, at times He is the mother, at times He is a friend, at times He is God, and at times He is a very strict teacher. So He has various roles He plays in life but one cannot describe Him. KM - Your final words for the listeners of Radio Sai all over the world. 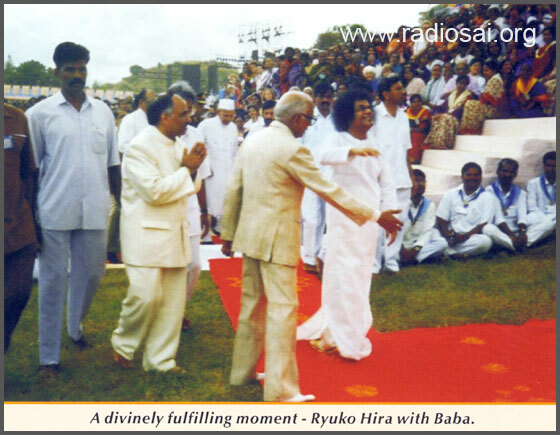 RH - I would like them all to visit Japan and to see Sai's glory as much as possible and as soon as possible. RH – Sai Ram to you!